(Bloomberg) -- Bonds of economies where central banks still have room to cut borrowing costs are the most attractive, according to Pendal Group’s Vimal Gor. Pendal changed its positions “materially” in the fourth quarter amid worsening global economic data by adding a lot of duration to portfolios, according to Gor, a long-term bear known for his consistent view that the world can’t handle higher interest rates. Central banks from the U.S. to Australia and Europe have pivoted away from hawkish biases toward more neutral stances as global economic growth eases, driving a decline in bond yields over the last five months. The Federal Reserve has pledged to be patient in adjusting rates since it turned more dovish in December and January, while Australia’s central bank softened a tightening bias, favoring a more neutral stance. The Reserve Bank of Australia will probably cut rates twice this year, in the second half, according to Pendal’s view, as forward indicators for unemployment -- which has remained resilient -- turn negative, and a slumping housing market needs a fire break, Gor said. That’s against consensus. Money markets are now pricing in a 25 basis point rate cut in August, with another in the second quarter of 2020. 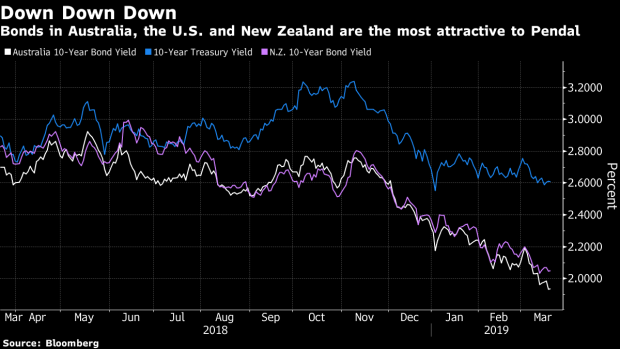 In Australia, Pendal has been long bonds focusing on the front end of the yield curve, especially the three years, Gor said. Three-year bond yields are now trading below the RBA’s 1.5 percent official cash rate, after falling about 50 basis points since the beginning of December. Ten-year yields have fallen below 2 percent for the first time since 2016. It holds long duration positions in the front end of the U.S. curve and has yield-curve steepeners in place, according to Gor, who expects yields to keep falling in the medium term. Which is why Gor expects central banks to start easing toward the end of this year or early next year. “We expect as this growth slowdown intensifies, that the central banks will be forced into easing policy later this year or early next year,” he said.